The PCE-UT 2152C Oscilloscope for the laboratory has a bandwidth of 150 MHz, a maximum sampling velocity of 25 GS/s as well as a measurement sequence in real time of 500 MS/s. The PCE-UT 2152C Oscilloscope for the laboratory is available with 512 Mb memory for each channel and a maximum sensibility of 2 ns. 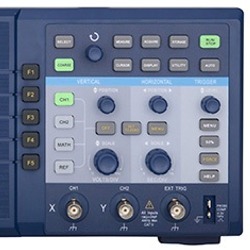 In addition, the PCE-UT 2152C Oscilloscope is equipped with the FFT function (Fourier transformation) as well as other common mathematical functions. 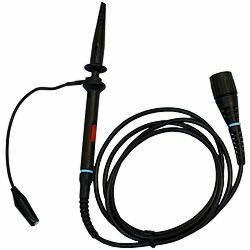 Thanks to its high storage capacity of 512 Kb the oscilloscope allows an accurate presentation of both curves and signals in a precise scale (zooming) for detailed analysis. With the high sensitivity of 2 ns the PCE-UT 2152C Oscilloscope for the laboratory can detect high frequency noises even with low time base that allows a signal expansion. With the zoom function it is possible to perform a detailed analysis of noise components. The graphic representation is shown in the coloured display. Through the USB and RS-232 connections data can be transferred to a computer for further analysis. Both the software and the data cable are included in the delivery. Data can be registered either in the internal memory or in the USB pen for being analysed. 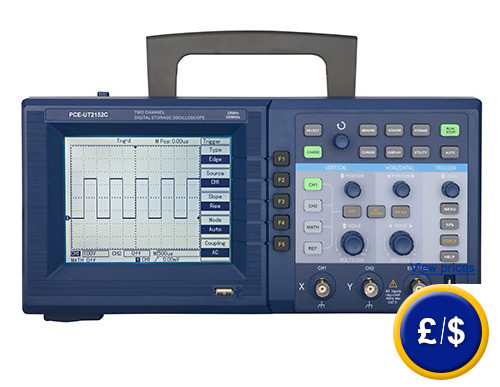 The PCE-UT 2152C Oscilloscope for laboratory is known for its good quality and price as well as the possibility to be used in many different fields such as training schools, production sectors, quality control, laboratories and for the research and development sectors. Here you can see other oscilloscope models with multiple functions (oscilloscope, multimeter, logical analyser, etc.) 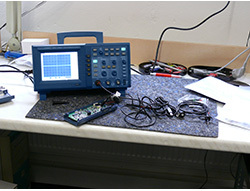 At this link you will find an overview of all the oscilloscopes available at PCE Instruments. - Internal storage for settings and signals. Vertical and horizontal broken line, reference, voltage, time, frequency. Probe heads are included in the delivery. To guarantee the highest flexibility a power meter 10:1 displays signals up to 50 V. By means of a variable capacitor signals can be quickly and easily compensated. 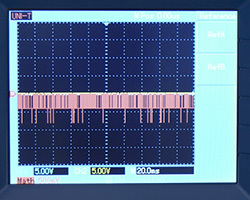 Through both USB part and RS-232 the oscilloscope can be connected to a computer. 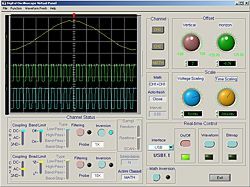 Waveforms can be analysed by means of the software. Besides, images can be recorded in bmp format. Its large LCD display with a resolution of 320 x 240 pixels is ideal to analyse waveforms accurately. At the botton of the display there is a USB port where the USB pen can be connected to record signals. At the adjoining image you can see the PCE-UT 2152C Oscilloscope working. Thanks to its compact dimensions and its light weight the oscilloscope can be used as a mobile instrument.